It has come to my attention, and I am sure that it will interest our readers, that Mr. Jesson Mata, of Blessed Sacrament Dominican Parish in Seattle has a Facebook page with lots of discussion and photos of the traditional Dominican Rite. It is called the Dominican Institute for Liturgy. 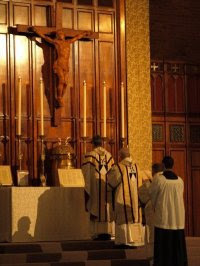 There are also postings about other liturgical activities in our Dominican parish in Seattle. I congratulate Jesson on this project.